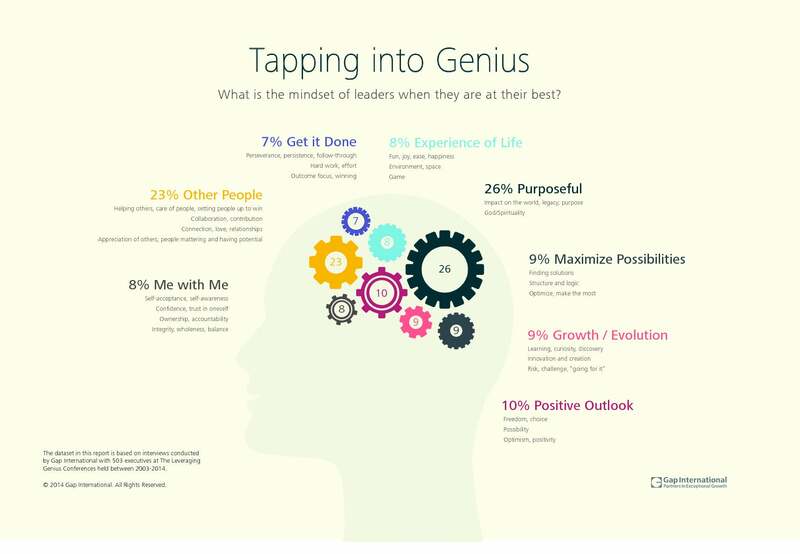 But while their styles may vary, successful leaders share very similar mindsets. That's the takeaway from Gap International, a global business consulting firm that conducted in-depth interviews with more than 500 global executives over the past two-years to get a sense of a leader's mindset at the time he or she recalls doing excellent, productive work. These interviews revealed that, overwhelmingly, leaders accomplished great things when they focused on how their own contributions connected to a larger sense of purpose. Such big picture thinking elevated leaders' energy levels and served as a motivator to keep pushing for better results. Exceptional outcomes were also achieved when leaders actively focused on their team members. Successful executives knew that to achieve greatness, they needed to ensure that those working below them were also highly motivated. In other words, in their moments of highest accomplishment, leaders focused on the impact their actions had on the world and people around them. Check out the infographic below for more information on a leader's mindset when he or she is operating "in the zone."